Today I have a handmade Easter Card that was inspired by one of my fellow team members on the Stamping New England Design Team. Our theme for the month of March is Easter cards. I changed the design of the card to use it for today’s Mojo Monday Sketch Challenge. Chocolate Chip, Soft Suede, Baked Brown Sugar and Sahara Sand. Fold a piece of Chocolate Chip cardstock in half at 4 1/4″ to make the card base. Use the Wood Grain embossing folder to add texture to a piece of 4 x 5 1/4″ Soft suede cardstock. 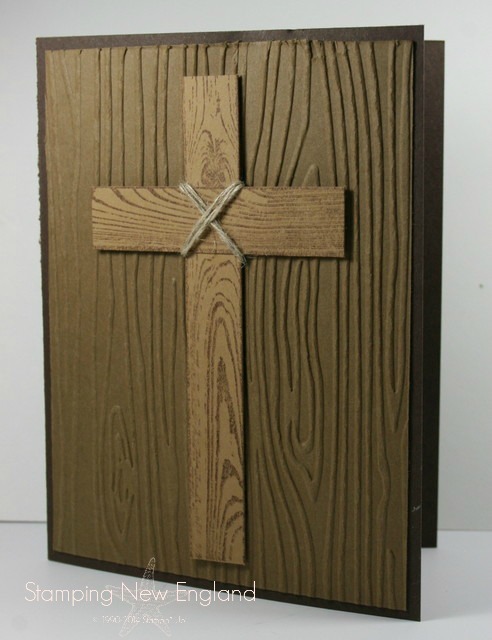 The Cross is made from scraps of baked Brown sugar cardstock that I stamped with the wood grain image from the Truly Grateful stamp set. You can also use the Hardwood Background stamp to create the woodgrain effect. Linen Thread is wrapped around the cross piece of the cross. The flowers are stamped using Daffodil Delight ink and the nPetite Petals stamp set and punched out with the coordinating petite petals punch. The center of the flowers have been highlighted with the pumpkin pie marker. The circle in the background is punched from a piece of Chocolate Chip cardstock. 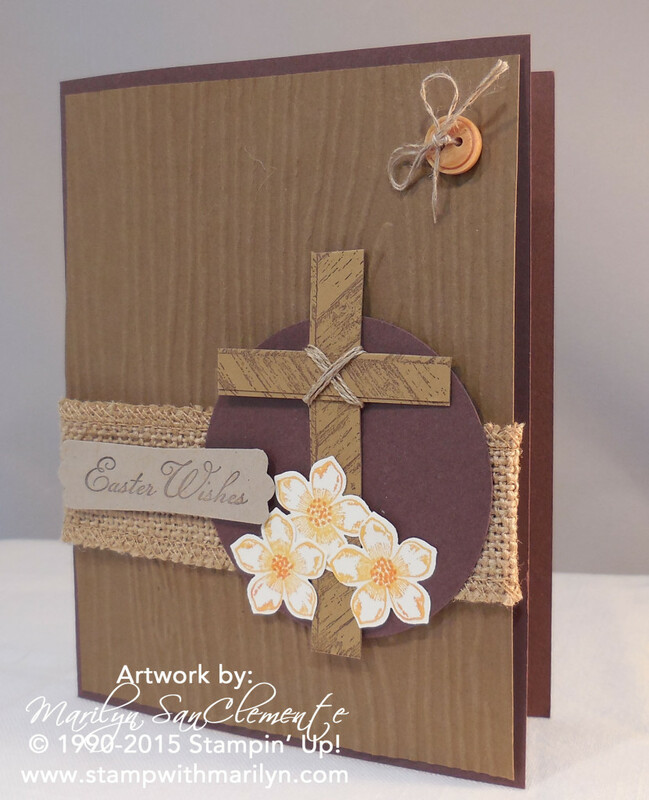 Easter wishes is stamped on a scrap of crumb cake cardstock and added with dimensionals. Finally I added a button threaded with linen thread to the top corner of the card for an embellishment. Stay tuned for more sneak peaks of Easter cards from the Stamping New England design team. Interested in card ideas each month from our design team? Join my Stamper’s Club and receive our card ideas each month. Check out the details HERE.